California overtime laws for truck drivers can be very complex. The reason for this is that there are several different laws that regulate the hours of service for truck drivers. Thus, in order to avoid overlap between different regulations, the Legislature tried to make it so that each truck driver is only regulated by either the Department of Transportation or the Department of Labor, but not both. Unfortunately, rather than making the regulations simpler, they ended up making things very complex. This page will only cover whether truck drivers are entitled to overtime pay. It will not cover whether the hours of service are regulated by any other department. I will also point out that the truck driver exemptions only apply to California overtime law. They do not apply to California meal breaks. Thus, truck drivers are generally entitled to meal breaks. The analysis for truck drivers is made additionally complex because there are two different sets of laws that affect overtime -- California overtime law and Federal overtime law. 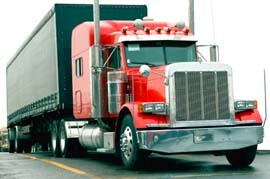 If a truck driver qualifies for overtime under either on of these, then she is entitled to overtime pay. However, the requirements and overtime amounts differ under each set of laws. We will look at each of these requirements to see if you qualify for any type of overtime pay. 1) If the truck that you drive has a gross weight rating of 26,001 lbs or more, then you are automatically exempt from California overtime law. You must read the section on Federal overtime to see if you qualify for that. 2) If the truck that you drive had a gross weight rating of 10,000-26,000 lbs, then you will be exempt only if your truck also drives in interstate commerce. 3) If the truck you drive is a farm labor vehicle or is transporting hazardous waste, then you are exempt from California overtime law. You must read the section on Federal overtime to see if you qualify for that. 4) If the truck you driver tows a trailer so that the combined length is more than 40 feet, you are exempt from California overtime law. 5) If the truck that you drive is regulated by the California Public Utility Commission (PUC), then you are exempt from California overtime law. 6) If the truck you drive tows a regulated trailer with a total gross weight rating of more than 10,000 lbs, you are exempt from California overtime law. Federal law provides for overtime after 40 hours of work in the work week. Unlike California overtime law, there is no provisions for overtime after 8 hours in a day or double time after 12 hours in a day. The issue with Federal overtime is simply whether you driver your truck in "interstate commerce." If you drive in "interstate commerce," then you are not entitled to overtime, unless you drive a truck weighing less 10,000 lbs or less. The term "interstate commerce" has a variety of meanings within the law. However, for tuck drivers a fairly strict interpretation of it has been used. Namely, the driver must physically cross state lines or be carrying goods as part of a continuous interstate shipment. Thus, if you physically drive across state lines, the analysis is simple -- you are exempt from overtime for a period of at least 4 months from the time you made that trip -- even if you don't make any more interstate trips. The problems come up when you don't personally drive across state lines, but are carrying good that recently crossed state lines. In this case, if the shipment is part of the same continuous movement of the goods, then the entire shipment will be considered "interstate," even though you never drove across state lines. For instance if a package is being shipped from Arizona to California and one driver takes it from Arizona to Los Angeles, and then another driver picks it up and finishes the local delivery in Los Angeles, both drivers would be exempt from overtime because the shipment would be considered to be "interstate." Where raw goods are shipped from out of state and then assembled or manufactured in state, the final shipment from the assembly plant to an in-state location is not interstate commerce. Any time the goods are changed or processed, the shipment chain is broken and any in-state shipping from that point is no longer interstate commerce. However, simply taking the goods our of a large package and then delivering smaller packages will not be sufficient to constitute a change. “A motor carrier is engaged in ‘interstate commerce’ when transporting goods either originating in transit from beyond the State or ultimately bound for destination beyond the State, even though the route of a particular carrier is wholly within one State. Merchants Fast Motor Lines, Inc. v. Interstate Commerce Commission, 528 F.2d 1042 (5th Cir. 1976). Traffic need not physically cross state lines to be in interstate commerce if the goods carried are in the course of through transit. ‘Through Transit’ is not to be confused with purely ‘local’ traffic not destined for points outside the state of origin. Id. For example, though the transportation by a carrier may be between points wholly in the same state, if the shipment originated outside of the state and was part of a continuous movement, then the in-state movement would be considered to be in interstate commerce.” Shew v. Southland Corporation (Cabell's Dairy Division), 370 F.2d 376 (1966). See United States v. Western Pacific Railroad Co., 352 U.S. 59, 77 S.Ct. 161 (1956). A recent change (August 2005) in the definition of "motor vehicles" by Congress may have an effect on whether drivers of vehicles of 10,000 or less are entitled to Federal overtime. Prior to the change, any truck driver that was drove in interstate commerce was automatically exempt. With the new law, the Department of Labor has taken the position that the truck must have a gross weight rating of 10,001 lbs or more. It is not clear how this law will be interpreted by the courts. Hopefully, the Department of Labor's interpretation will be upheld as this gives a common sense definition of what a "commercial motor vehicle" is. However, until courts have had a chance to review the law, it is possible that the Department's interpretation will not be sustained. However, at least one court has adopted the Department's interpretation. In 2006, the U.S. Congress tried to pass a bill that would have eliminated the 10,001 lbs requirement. The bill did not pass. I have some more detailed information about this law posted on my Labor and Employment Law Blog. California overtime laws for truck drivers are very complex. The above discussion only provides a general overview, and there are additional exceptions and nuances to the above laws. As such, if you are a truck driver in California and feel you are not being paid proper overtime, please fill out an free overtime evaluation form.